"I can't recall a tropical cone developing that rapidly into a major hurricane prior to arriving in the central Caribbean." Satellite image of Tropical Storm Irma pictured here in the Eastern Atlantic Ocean on Aug. 30, 2017. SAN JUAN, Puerto Rico — Hurricane Irma grew into a powerful Category 4 storm Monday as it approached the northeastern Caribbean and was forecast to begin buffeting the region Tuesday. 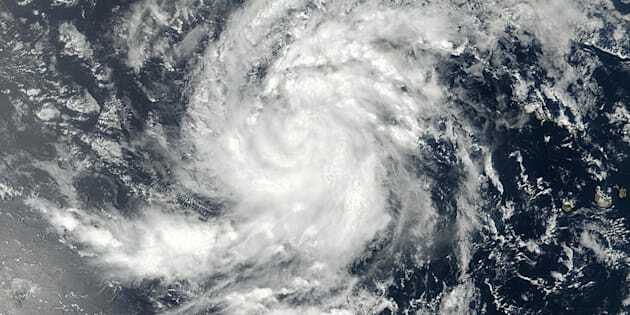 The storm had maximum sustained winds of 130 mph (215 kph) late Monday afternoon, and the U.S. National Hurricane Center said additional strengthening was expected. Irma was centred 490 miles (790 kilometres) east of the Leeward Islands and moving west at 13 mph (20 kph). Emergency officials warned that the storm could dump up to 10 inches (25 centimetres) of rain, unleash landslides and dangerous flash floods and generate waves of up to 23 feet (7 metres) as the storm drew closer. "We're looking at Irma as a very significant event," Ronald Jackson, executive director of the Caribbean Disaster Emergency Management Agency, said by phone. "I can't recall a tropical cone developing that rapidly into a major hurricane prior to arriving in the central Caribbean." The storm's centre was forecast to move near or over the northern Leeward Islands late Tuesday and early Wednesday, the hurricane centre said. U.S. residents were urged to monitor the storm's progress in case it should turn northward toward Florida, Georgia or the Carolinas. In the Caribbean, the director of Puerto Rico's power company predicted that storm damage could leave some areas of the U.S. territory without electricity for four to six months. But "some areas will have power (back) in less than a week," Ricardo Ramos told radio station Notiuno 630 AM. The power company's system has deteriorated greatly amid Puerto Rico's decade-long recession, and the territory experienced an islandwide outage last year. Meanwhile, the governor of the British Virgin Islands urged people on Anegada island to leave if they could, noting that Irma's eye was expected to pass 35 miles (56 kilometres) from the capital of Road Town. Antigua and Anguilla shuttered schools Monday, and government office closures were expected to follow. On the tiny island of Barbuda, hotel manager Andrea Christian closed the Palm Tree Guest House. She said she was not afraid even though it would be her first time facing a storm of that magnitude. "We can't do anything about it," Christian said by phone, adding that she had stocked up on food and water. "We just have to wait it out." Both Puerto Rico and the U.S. Virgin Islands expected 4 inches to 8 inches (10-20 centimetres) of rain and winds of 40-50 mph with gusts of up to 60 mph. Puerto Rico Gov. Ricardo Rossello activated the National Guard, cancelled classes for Tuesday and declared a half-day of work. He also warned of flooding and power outages. "It's no secret that the infrastructure of the Puerto Rico Power Authority is deteriorated," Rossello said. Meteorologist Roberto Garcia warned that Puerto Rico could experience hurricane-like conditions in the next 48 hours should the storm's path shift. "Any deviation, which is still possible, could bring even more severe conditions to Puerto Rico and the U.S. Virgin Islands," Garcia said. The U.S. Virgin Islands said the school year would open Friday instead of Tuesday. "It's not a lot of distance," he said, adding: "It could affect us in a tremendous way. I'm not saying that to alarm anyone or scare anyone, but I want the Virgin Islands to be prepared." A hurricane warning was issued for Antigua and Barbuda, Anguilla, Montserrat, St. Kitts and Nevis, St. Martin, Saba, St. Eustatius, St. Maarten and St. Barts. A hurricane watch was in effect for Puerto Rico, Vieques, Culebra, the British and U.S. Virgin islands and Guadeloupe. A tropical storm warning was in effect for Guadeloupe and a tropical storm watch for Dominica.